However most people don’t achieve balance without effort. If you try and stand on one leg and tie your shoe lace you are certainly going to have to do some work to prevent yourself from falling over. Everyday, in fact, your ability to walk upright requires a constant balancing act yet you do it so often that you don’t even realize you are doing it. Also, because you do it so often your body has developed a way to ensure maximum balance with minimal effort. That didn’t happen overnight, it took years and years of practice yet many time we forget that. Shouldn’t you be able to achieve the same ease of result with everything else? Not without putting in effort you won’t. The key to balance is control as I wrote in an earlier blog post and control requires effort and discipline (i.e. sweat). In many ways control comes back to being a mental discipline because your mind controls just about every function of your body. Interestingly, one could also content that those who can’t control themselves are destined to be controlled by others. Like a true Zen puzzle, there are many small pieces which individually they appear very simple. However as you start to interlock them you begin to discover that they actually interact and influence each other. Understanding the pieces comes first, getting them to work together is the challenge and only then do you achieve balance. Yet that all comes to naught without control. If balance is the goal, effort is the way. which as you can see has the date and topic of the post. Problem is that behind the covers the URL was still the top more complex one. Now if you subscribed to the blog via Feedburner you could read the post but when you clicked on the post in your reader you received a login prompt. Typically, you’d go no further. To my own detriment I have known about this issue for a while but never gotten around to getting it fixed. I was having a conversation with Hilton Travis about the issue recently and he quite rightly pointed out that even though the RSS feed does display in the reader correctly it only displays the first part of the blog post. Thus, if it is a long blog post and you want to read it and click on the item to get more you are confronted with a login and password. As Hilton quite rightly pointed out, this fact is limiting my readership and frustrating existing subscribers. D’oh, what an idiot I am! Good example of a failure of customer service there. Shame, shame, shame. So long story short, I believe the issue should now be resolved so that if you click on a link from Feedburner that has a cryptic URL would should be taken to the correct post, without any password prompts and the URL should now read the updated friendly one. If it doesn’t PLEASE let me know and I will fix this. Apologies to all who have suffered through my lack of attention on this matter and I hope your reading experience with this blog is now much better. 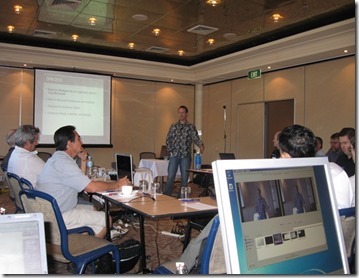 Why is that important for SharePoint Foundation 2010 on SBS 2008 you may ask? Well to install SharePoint anywhere you need a version of SQL Server installed first. Generally, if you don’t already have a version SharePoint will install a free version automatically for you. With WSS v3 this version was SQL Server Embedded Edition 2005 (#SSEE) which has no limit on the size of databases (although it has other restrictions). SharePoint Foundation 2010 in contrast installs SQL Express 2008 which has a database limit of 4GB. So if you did really want to install SharePoint Foundation 2010 on SBS 2008, and migrate your existing WSS v3 site across without having to pay for a version of SQL Server and your SharePoint content database was > 4GB then you were out of luck. So, if you have SharePoint content databases > 4GB and you don’t want to pay for a full blown version of SQL Server you can now use SQL Server Express 2008 R2. Only problem is that you have to install this version first before installing SharePoint Foundation 2010 AND you also have to do an advanced SharePoint install, which means you have to setup and configure SharePoint manually on the server. This is not a simple process for someone not familiar with SharePoint so I would not recommend it. I think this is where SharePoint sometimes gets a bum wrap. Out of the box there are some limitations, however they can be overcome, problem is that information isn’t always readily available. That is exactly why I document all of this in my Windows SharePoint Operations Guide that I make available for people. If you are going to be working with SharePoint my Guide is going to save you hours and hours of mucking around looking for the answers. Come July 1 I’ll also be announcing another improvement to the Guide so stay tuned. So thanks to Andy Parkes I’m off to rewrite my SharePoint Foundation 2010 on SBS 2008 guide to incorporate SQL Server Express 2008 R2 because bigger databases are always better right? I’ve been helping another reseller with some recruitment using a method I’ve developed over the years to find not just competent technicians but also good employees. However, I must admit that I’m pretty disappointed in the quality of responses that I’ve seen so far. I was also stunned to see that none of the applicants for the position used any sort of social media tools. No Linkedin, blogs, etc to promote their qualifications. <img src="http://lh3.ggpht.com/-tLl26o1gJao/UPlS28IiSmI/AAAAAAAAHe4/BQGYSYWHOx0/videob54ec656fb61%25255B4%25255D.jpg?imgmax=800" style="border-style: none" galleryimg="no" onload="var downlevelDiv = document.getElementById('b3024a1b-fae0-454f-bbcb-6f55d5a0e17f'); downlevelDiv.innerHTML = "
If you are someone looking for a better job then you really need to be using social networking and becoming connected with as many people as possible. In many cases it is the strength of weak ties that lands you the job you never expected via a friend of a friend. Best of all, most of the tools of social network are free to join and maintain. Now if you are looking to hire someone I gotta say that the same message also applies to you. If you think you are going to land that great employee simply by running an online ad I think your chances are going to be fairly slim. Many smart businesses, again are using social networking to stay in touch with ex-employees, customers and other contacts. In this way they are extending their reach and ‘weak links’ so when the day comes that they need someone they will either have that individual with their existing social network or they can use their network to find someone. As a business or an employee you need to maintain and foster your networks but by doing this you are constantly giving yourself the greatest chance of having the position or person you want find you. Personally, I think now days the first place I’d start looking for someone is via Twitter or Linkedin. Why? It doesn’t cost anything. Only after exhausting all my social networks would I consider running an online ad. Most amazingly of all, many small businesses totally ignore social networking as a method of recruitment. Most prefer to employ ‘someone they know’ but few utilize the tools that effectively allow them to do just that. To me, this is simply another example of how important social networking is in the SMB market. Smart business are leveraging it for all sorts of things like marketing, publicity and, as I outlined here, recruitment. Most businesses know how hard it is to recruit good staff. You have a much greater chance if you go to where progressive talent is located (i.e. social networking). If you simply run an online add you are really just ‘hoping’ there ‘maybe’ someone out there. Not a very good return on investment in my books. Times are changing. If you are a good business or a good employee don’t rely on the old ways of recruitment, start to understand and utilize the tools that social networking provide and save yourself time, money and really stand out from the crowd. I really feel sad for not only all those people who have submitted ‘bland’ CVs for me to evaluate but also for the business who is using this method to recruit. The chances of any of them truly finding what they are after is very slim in my books, very slim indeed. 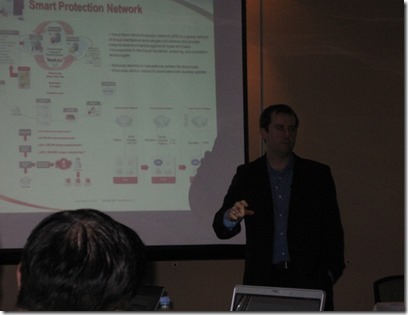 Over the weekend we ran a Backup and Disaster Recovery workshop for SMB resellers. It was pleasing to see the event so well attended, with people even travelling from inter state to be present. I’d like to think that we did something a little different at this workshop by inviting a number of vendors to demonstrate the ability of their products to not only backup a standard SBS 2008 server but also to do a bare metal restore to different hardware without them actually touching the hardware (a volunteer was used to perform all the work). The consensus on day was that BackupAssist provided the best result in our tests but all vendors performed superbly and we thank them all for their efforts. 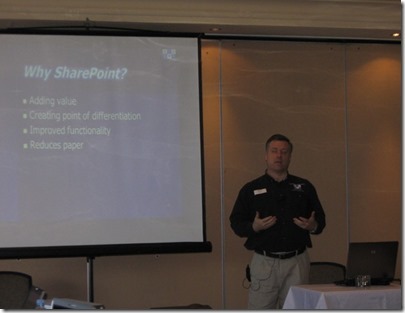 yours truly on SharePoint and Cloud Computing. We where also luck enough to have both Susan Bradley and Kevin Royalty present remotely. Many attendees commented on how much they liked the mixed of presenters and topics over the two days so we take this opportunity to thank all those who did take the time to present over the workshop. 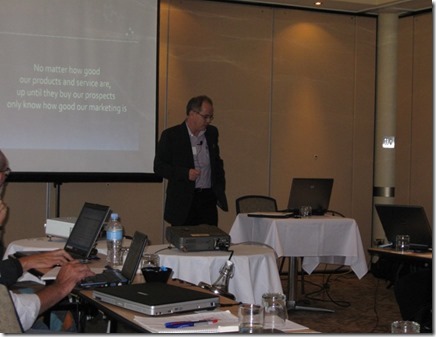 Thank you Sydney SMBiT Professionals group for organising most stimulating and informative workshops. They were well run and had the level of information I was looking for. Each of the workshops were true to their names and the practical nature of them, was what I wanted to see and not the marketing hype of the vendors. Well done and I am looking forward to more similar professional sessions. Great value for money and a good investment of my time. You’ll also find some further feedback from Susan Bradley and Peter Vane that is very much appreciated. A big thanks for the day must also go to Hilton Travis from QuarkIT who travelled down from Queensland to webcast and record the event (as well as provide his unique point of view on most topics) as well as Ryan Spillane and David Wales from Correct Solutions for the hardware and the pre work that went into getting it ready for the workshop. A heartfelt thanks. We are now towards the next workshop on the 20th and 21st of August that will be around business development and cloud services. Make sure you reserve the days because after this one I’m pretty sure places are going to fill really fast! One of the most important things an independent IT Professional (or anyone for that matter) needs to do is take care of their health, for without your health you can’t hope to earn a living. Sadly, this is generally not the case for most IT Professionals I know as well as many other people I must say. The secret has really got more to do with your mind than your body, but that is a topic for another blog post. Attempting to be health conscious myself I spend a certain amount of time each day at a small local gym keeping my self in condition. I do however notice a constant stream of people who come in and ‘pretend’ to exercise. To get any benefit from the exercise you are doing you need to look at your heart rate and in effect raise it from what is considered the ‘resting rate’. Here is a good article all about heart rate and intensity, but basically you should exercise with your heart rate at 65-85% of its maximum (which varies with age) and maintain that for the duration of your workout. Doing that consistently has all sorts of benefits which again is fodder for another future blog post. What I want to focus on here is what also comes with lifting your intensity – sweat. After every work out I make sure that I’m sweating, if I’m not then I haven’t trained intensively enough. However, the other people I see in the gym would probably get more exercise sitting on the couch watching TV. They are deluding themselves if they think have achieved any benefit of going to the gym for that time period. They are simply wasting their time because they are not even breaking a sweat. So let’s now translate that to how you run your business. Can you honestly say that you are lifting the intensity of your business? Are you pushing your business (or yourself) to make it ‘sweat’? Unfortunately, most are like the people I see coming into the gym, fooling themselves that they are working out. Their business may have made it into the gym but it sure ain’t doing a workout! Again, there is no sweat. Much like maintaining fitness, you need to push your business beyond the comfort zone. Again like exercise, you don’t go mad and try and run a marathon without preparation you need to build your intensity up but you need to keep building, you need to keep sweating if you plan to improve it. There are going to be the odd aches and pains along the way but the main aim of the game is to continue to lift the average which is never going to happen if you leave your business sitting on the couch eating potato chips. Take a look around at the people that you know, are they lifting their intensity? Are they looking to improve their average? Are they and their business getting fitter? A wise man once said that you are the average of your surroundings. If you want to improve your average many you have to make a change to your environment. Any change will require effort resulting in sweat which is the easiest way to know you have increased your intensity. Make sure that when you take yourself or your business to the gym you come away sweating. I can assure you that over time that the results of this effort is worth the investment. No not quite 100 years yet (but that will happen one day soon) I actually reached 100 Facebook friends. Wow! I can’t say that I’d even have thought I’d see the day. Now obviously that number can drop back if some ‘un-friends’ me (which would make me sad) but reaching triple figures made me ponder this whole ‘friends’ thing, briefly at least. <img onload="var downlevelDiv = document.getElementById('5cea6b2d-3296-4ecd-af32-379c01136a8a'); downlevelDiv.innerHTML = "
The Internet has allowed a huge amount of fake networking. Why? Because there’s a scoreboard that clicks over and allows you to compare that to others. Just because Facebook says they’re your friends are they really? And once they are your friends what then? With almost 500 million Facebook users there is little doubt that anyone, let alone businesses, can afford to ignore the ‘Facebook factor’ but my question is, if you use Facebook for business what do you use it for? What are your trying to achieve with it? If you simply want to accumulate more friends, send me a request an I’ll be your friend but I’d really like to hear what business strategy people have with their Facebook accounts. Drop me an email (director@ciaops.com) and let me know how you use Facebook to grow your business. Also, please feel free to Facebook friend me via http://www.facebook.com/ciaops, I need to keep that score ticking along. Many of the videos that I create I place up on YouTube. One of the biggest limitations I find with YouTube is that videos can only be no longer than 10 minutes. This means that I have to split up many of my free webinar videos which I believe reduces their effectiveness. For a while now I have been using SlideShare to share documents and presentations I have created. Turns out that SlideShare now has the ability to host videos, and best of all they place a limit on the file size of the video not the length. Going forward I’ll still be using YouTube to host my videos, simply given its popularity but for anything longer than 10 minutes I’ll post it to SlideShare. However, if you are interested please go and have a look a the videos on SlideShare and let me know what you think and whether they work for you.